Social media has changed the way our entire world works. Everyone has an equal voice and immediate access to vast networks of friends and followers. Customers are vocal--sometimes passionate--about the brands, products and services they use, and what they like and dislike. For marketers and PR professionals, this isn't news. According to a 2011 study, 84 percent of global brand executives feel their brand's sociability is not up to world-class brand standards. More companies, whether they are B2B or B2C, start-up or enterprise, are integrating social media into their overall marketing plans and dedicating a line in their budgets for resources like monitoring tools and community managers. Their goal is to take advantage of the incredible opportunities available in the social space, like lead and sales generation, real-time customer service and the opportunity to identify and work with brand evangelists. 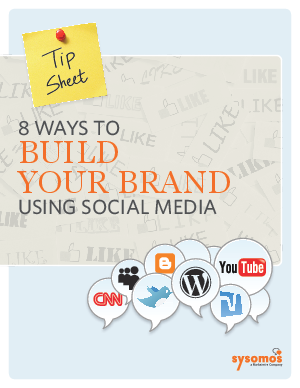 Here are 8 tips that Sysomos recommends to help build your brand with social media.